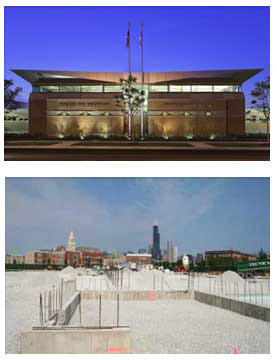 The Lombard Company is experienced in building government facilities for numerous local governments and municipalities throughout the Chicago Metroplotan Area. Our quick turnaround capabilities and careful attention to detail ensure your government project is completed as scheduled and to your complete satisfaction. The Lombard Company would be happy to work with you as the general contractor on your next project and is certain you will be more than satisfied with the results. 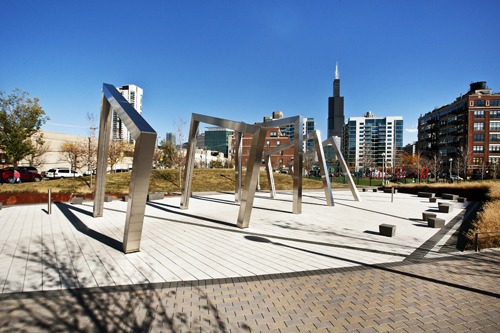 The Lombard Company is proud to have constructed this exciting new park concept in Chicago’s west loop neighborhood. Mary Bartelme Park is named after legal pioneer and child welfare advocate Mary Bartelme who was born nearby in 1866. After years of planning by community residents, aldermen and the Chicago Park District, construction of the park, originally known as Park 542, was completed in late 2010. The Lombard Company worked closely with landscape architects and the CPD to create what has become a popular community centerpiece. Mary Bartelme Park has many unusual topographical features not found in other parks. The landscape architect, Site Design Group, created a unique design that incorporates several berms to add a vertical dimension to the site. These hills not only divide the space for varied activities but also offer privacy from busy adjoining streets. Central to the park’s plaza are five large stainless steel structures that appear as tilted arches. These interesting walk-through structures actually provide a refreshing misting water cloud – a clever and welcome comfort during Chicago’s long hot summers. Walkways use permeable materials that prevent flooding by distributing rainwater evenly through the irrigation and drainage system. These pavers are nicknamed “smog eating concrete” because they contain a photocatalytic property which, when exposed to sunlight, actually destroy several atmospheric pollutants found in urban settings. Mary Bartelme Park won the “Best Open Space” award given by the Friends of Downtown Organization. This is a unique project completed by The Lombard Company. The visitor center is a concrete, steel and heavy timber structure with Ashlar Limestone Veneer. The project also included heavy timber construction, metal roffing, rock excavation, new roadways and sidewalks. Initially designed as a LEED silver project, it ultimately won Gold LEED Certification. Sagawau Environmental Learning Center, in southwest Cook County near Lemont, promotes the study of nature in a relaxed setting. 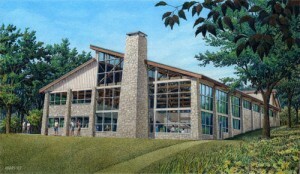 A visitor center and classroom building includes exhibits on geology, history, and habitat management. Some featured programs include environmental education for high schools, workshops for teachers and other adults, tours of Cook County’s only canyon, and general public walks and programs. Sagawau provides habitat for over 100 species of migrant and resident birds, and is home for the banding program of the Chicagoland Bird Observatory. In winter Sagawau becomes a premier Nordic ski location, with rentals, lessons, and groomed trails. Camp Sagawau is owned by the Forest Preserve District of Cook County. 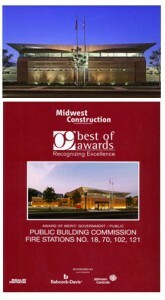 The Lombard Company completed a major and challenging project for the public building commission of Chicago. The new $9.5 million firehouse is located at 1360 South Blue Island Ave. It includes a modern design to accommodate better living, remote training and an office workspace. The one-story, 16,000 square-foot facility replaced Chicago’s oldest firehouse, Engine Company 18 at 1123 West Roosevelt Road, which was built in 1873. 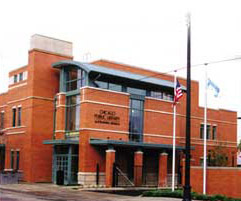 The new Engine Company 18 is also a green firehouse, designed to meet the U.S. Green Building Council’s guidelines for a Leadership in Energy and Environment Design – or LEED – silver rating. The new firehouse includes solar panels, an exhaust heat recovery system, drought-tolerant landscaping and recycled materials were used where possible, including the benches in the locker rooms, which are made of recycled wood. The Lombard Company was honored by Midwest Construction Magazine with an award for Building Excellence on the Engine Company 18 Fire Station. Locker rooms and bathroom facilities to accommodate the needs of both male and female firefighters. The facility is the sixth to be opened under Mayor Daley’s Neighborhoods Alive 21 program. This demanding project was handled by job superintendent John Kokes and project manager Jim Dombrowski. This project illustrates Lombards’ dedication to new technology. Including advanced construction techniques to Green Building philosophy. The Lombard Company recently completed a new $4.5 million, 15,500 square foot, two story, City of Chicago Austin-Irving Branch Library that was designed by Antunovich & Associates. This new high-tech facility replaces a small storefront unit and is one of a dozen branch libraries that utilized standard designs to make construction more efficient and cost effective. These progressive designs incorporate spaces that help each new library better serve its community by offering, such items as childrens reading programs, high school equivalency and financial planning classes for adults and various additional resources to enrich the learning process for library patrons of all ages. Construction on a city lot in a densely populated neighborhood can present some challenging situations, all of which were handled by Lombard’s project management team. The Lombard Company teamed with EarthTech of Oak Brook, Illinois to design/build additions and renovations to the Bolingbrook Towncenter. The Towncenter, which houses the Village of Bolingbrook’s municipal and community offices, as well as the police department, was originally constructed by Lombard under a competitive bid contract. The design/build contract format reflected a current trend in project delivery systems that emphasizes a partnership among owner, designer and builder. This project involved the construction of a new board room and an outdoor stage/amphitheater, plus an expansion of the police department. The interior of the existing building underwent extensive architectural, mechanical and electrical overhaul and upgrades, and the entire facility was reroofed. The work was completed in phases, allowing the building to remain fully occupied and all Village services to continue without disruption to Bolingbrook residents. Project Superintendent Jim Provis, a dedicated 44 year veteran of The Lombard Company, was the individual in charge of the initial facility’s construction in 1979, and at the specific request of the Village administrators, was assigned supervision for this ambitious project. Jim exemplifies the type of construction professional who generates client satisfaction and repeat business for The Lombard Company. The Lombard Company constructed a new 170,000 s.f. 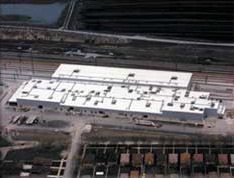 maintenance and repair facility for Metra’s electric rail car division. The pre-engineered metal building includes an architectural precast wainscot manufactured by Lombard Architectural Precast Product Company. The building was situated on a 24-acre site. The scope of work included the necessary civil, structural and electrical work necessary to bring electric rail service into and out of the building. 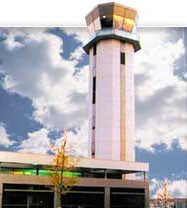 Midway Airport Traffic Control Tower is a fine example of The Lombard Company and its subsidiary working together. Lombard won the contract by public bid and immediately enlisted the help of Lombard Architectural Precast Products Company. The 130 feet tall control tower is comprised of thirteen (13) levels of structural precast concrete segments, fabricated by Lombard Architectural Precast Products in the Alsip, Illinois Plant. The exterior surface of precast is white limestone aggregate exposed by medium sandblast. The cab of the control tower was prefabricated on the ground next to the tower and hoisted in a single lift of 52,000 lbs., using a 300-ton crane. The adjacent office building has a conventional structural steel frame with an applied precast, clad metal wall panels and window wall.